Digital Imaging and Photography: A little history Part 1. My work has not been consistent for some time now. I started out focusing on drawing and painting producing everything from still lives to abstractions and mixed media works. My mature work, after much wrangling and producing rather odd, stupid and pointless pieces, became a kind of “critical post-modernism” (to borrow from Frederic Jameson). These works were meant for mass distribution as flyers, postcards, bill posters and projections of some kind. I appropriated from a variety of sources like forties and fifties science books, the National Geographic and “Peter and Jane” books. With my approach being largely inspired by the art of Barbara Kruger and Jenny Holzer's and their statements and aphorisms, I added my own potentially subversive statements to my chosen images. They seemed to give them a transforming charge and power, that suggested to me that art could morally influence the world, challenge the powers that be and challenge/subvert political/public discourse. It was an art of the street, an art that critiqued mass culture, consumerism and official language: military, political, governmental and economic. I fused that language with culled imagery. I don't think that many believe that art can transform life any more. Okay, so you have Banksy and Posterboy, with their powerful and critical pieces, the true heirs to Grosz, Heartfield, Hoch and Hausmann. The attacks laid at Holzer and Kruger from some quarters, notably Richard Kostalanetz and Jeremy Gilbert-Rolfe made me question the effectiveness and purposefulness of such art and the making of art. 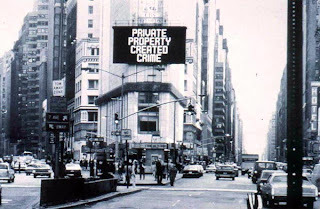 Kostelanetz referred to Holzer's art as 'dull' (2001, p. 290) and Kruger's work as 'advertisements for themselves' (Ibid. p. 354). 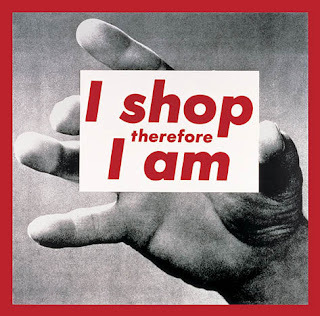 Gilbert Rolfe compares Holzer's slogans to those of 'Mao Tse-Tung or or the Ayatolloh Khomeni' (1995, p. 30), preferring to view art as 'beyond piety' to borrow from the title of his collection of criticism. The attacks were furious and still leave me unsure in my own mind at the relevance and power of political art. Ideology and critical discourse aside, I quickly bored with the sort of seemingly uncreative post-modern pictures that that relied upon so much of the past, without the creative challenges of producing a convincing picture. I began to look again at picture making.